I like to stay on top of the insider trading activity for all shares and/or stock warrants which I own as well as all of the companies which have stock warrants trading. Normally I am not searching for large cap companies as I really like to focus my search on the small companies in all sectors trading on the cheap, say less than $1. That said, I came across Cameco Corporation TSX:CCO which of course is in the uranium business and some of the uranium companies are starting to run. The shares also trade on the NYSE under the symbol, CCJ. 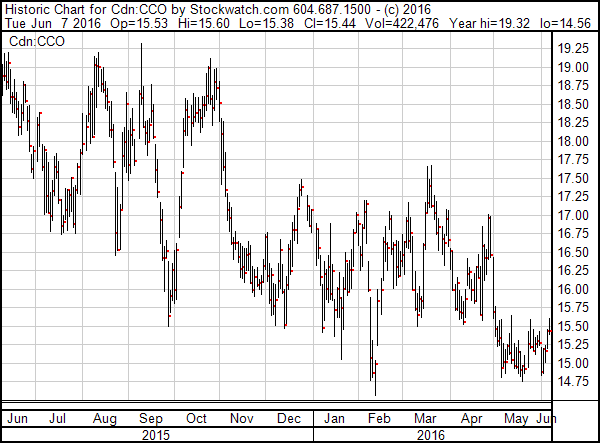 I see that 10 or more insiders of CCO are buying in the open market at 15.50 to 16.50 over the last 3 months and best yet is the shares are still trading in this price range and it looks like there is limited down side risk, see the chart below. If this is of interest to you, great. If you would like to know more about my services please visit http://CommonStockWarrants.com.